The master’s degree is the fastest-growing college credential in this country, but is that a good thing? Eight percent of the population now holds Master’s degrees, the same percentage that held bachelor’s degrees (or higher) in the 1960s, reports Vox. Master’s degrees in education were by far the most popular, holding at around a third to a quarter of all such degrees from 1971 to 2012, though MBAs had taken the top spot by 2010. In fact, the increase in the number of MBA degrees is astonishing: Only 11.2 percent of master’s degrees were in business in 1971, but in 2012, they were a whopping 25.4 percent. This “credential inflation” is “in large part driving the student loan crisis”. The rise of the master’s degree is likely a product of credential inflation. As more and more people acquire bachelor’s degrees, those who wish to make themselves stand out go on to get the MA. And as Vox points out, while a Master’s degree does have a positive impact on earnings, the overall debt of people with undergraduate and Master’s degrees has grown markedly in the past decade. In fact, as we recently noted, graduate student debt is in large part driving the student loan crisis. The recently expanded loan forgiveness program is “tailor-made for graduate students”. Students who took out big loans for graduate school and those with higher incomes stand the most to gain financially under President Obama’s expansion of the federal government’s loan forgiveness program. Lawyers, doctors and other highly trained professionals who utilized federal loans throughout their post-high school education could walk away with most or all of their graduate school debt forgiven by the federal government under the program, say experts. Is this good for our economy? … But we shouldn’t want an economy that favors people with polished résumés over people with good ideas. This data is not a good sign for our economic health. It seems to be another case where excessive government intervention has created inefficiencies resulting in unintended consequences. Advanced degrees don’t generally improve student achievement levels. A number of studies have shown that teachers with advanced degrees don’t, necessarily, produce higher student achievement than teachers who hold only a bachelor’s…. One study from the Center for American Progress reported “that states waste money by giving salary increases to teachers as a reward for getting a master’s degree, spending nearly $15 billion annually on such pay hikes”. 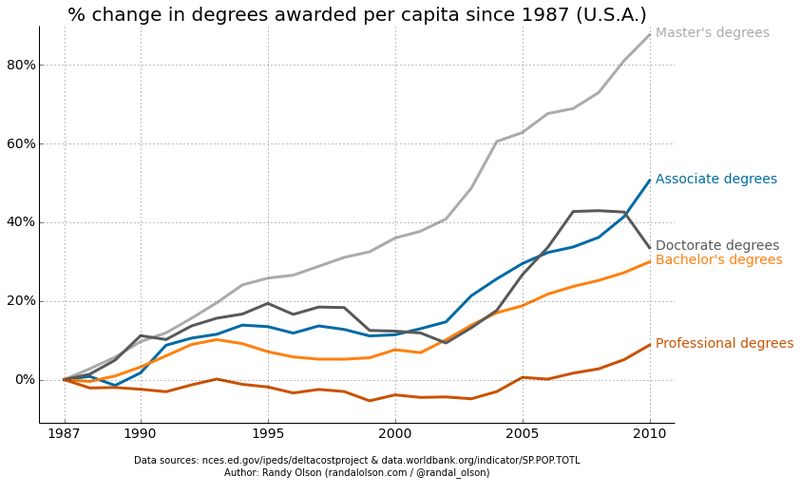 Randy Olson, “College degrees awarded per capita in the U.S.A.”, Randal S. Olson, June 12, 2014. Walter Russell Mead, “The Rise of the Master’s Degree”, The American Interest, May 22, 2014. Susan Ferrechio, “The surprising winners of Obama’s student-loan program”, Washington Examiner, June 12, 2014 . Tyler Durden, “Unintended Consequences Of Obama’s Student Loan Policies”, Zero Hedge, June 13, 2014. Ida Lieszkovszky, “Liberal Think Tank says Advanced Degrees Don’t Make Better Teachers”, StateImpact Ohio, July 18, 2012.